GREEN CRCLE SALON - CHADWICK AND IGOR CARING FOR YOUR CURLS™ Curly hair, Best Hair salon in Fort Lauderdale. The south Florida home for curls. Chadwick and Igor and their team provide expert, curly hair styling using the award-winning salon specially formulated for curly hair. 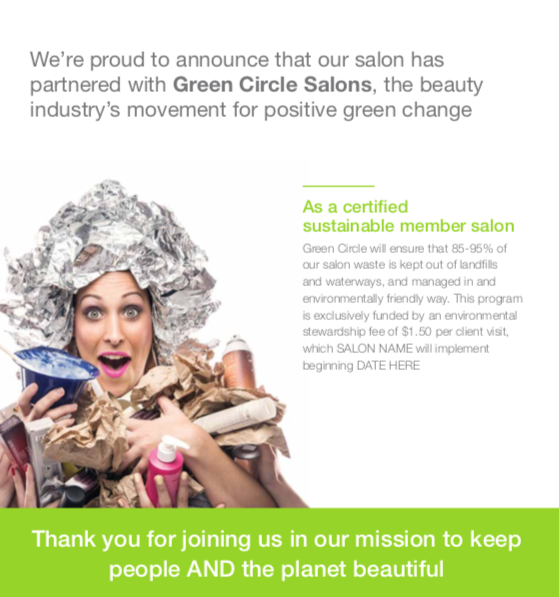 ​We are prond to be a sustainable salon. With solution to recover and repurpose beauty waste ensuring that we can help keep people and the planet beautiful. We are able to transform beauty waste into a desirable commodity through an award-winning platform built by the industry, for the industry. We are repurpose and recover up to 95% of the resources that were once considered waste; materials such as hair, leftover hair color, foils, color tubes, aerosol cans, paper and plastics. Hello to all of our Curly guests! The beauty industry poses many challenges to the environment, from sourcing of ingredients, to disposal of packaging and products. Through our alignment with these guide lines, we hope to ameliorate the ecological footprint we are making, and instead, implement simple green changes that will make both our salon and our industry, more sustainable. We are confident that as fellow stewards of the planet, you will support our initiative to help keep our communities cleaner and more vibrant. Did you know that currently all aluminum foils and color tubes are not being recycled and are sent to landfill? 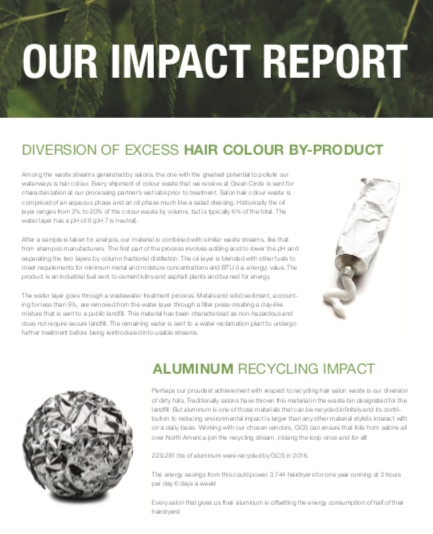 We were interested to learn that 95% of all aluminum can be recycled over and over again, including the foils and color and tubes that we use here in our salon. We will take an environmentally responsible stand and ensure that all of our metals are properly recycled. landfill space, and decrease the amount of toxins going into our landfill sites. more sustainable projects. 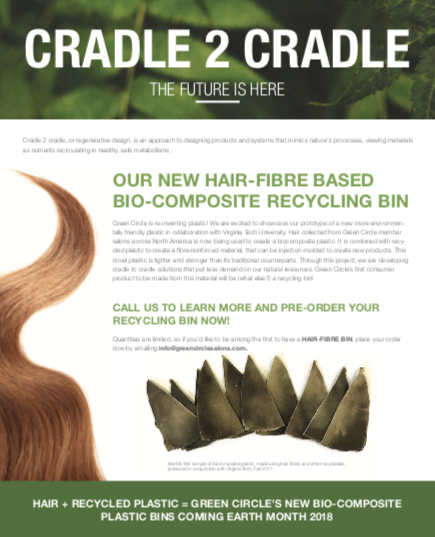 GCS, in connection with various partners, is looking at ways that hair can play an important role in a number of commercial applications. It’s exciting to know that hair can be used on our oceans to help in oil spill clean-up and recovery projects. Did you know that all excess chemicals including color, perm solutions, softeners, relaxers and ammonia get rinsed down the sink and ultimately find their way into the water supply? This is the ugly truth of the industry. Our solution will be to send all excess colors waste to a hazardous waste facility where they will be incinerated with other chemical wastes. The ensuing heat that is created generates new sources of energy! All this while stopping these chemicals from ending up in our community’s water supply. Our vision is to ensure that everyone has a role in change. To us, that means asking for change and contributing towards it. This helps us complete the circle! Our team from the Ouidad Salon by Chadwick and Igor encourages our curly friends to take this initiative with us. We started this concept by having 100% energy efficient LED light bulbs, UVA/UVB blinds that protect us from the heat inside the store. We want to be transparent with all our guests on the accountability of our new fee and why we have decided to implement it. We believe that by taking these important and small incremental steps now, we can pre-empt future high costs that may come as a result of an emerging green economy and the ever-increasing cost of energy and environmental regulation like it is already mandatory in some states. We are excited about being leaders in our community and in the industry and we are delighted that you care for our world as much as we do. We look forward to growing a Curly, greener, future together!